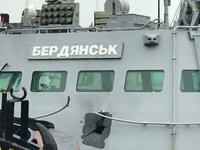 Two Ukrainian sailors injured in the Kerch Strait, Andriy Artemenko and Andriy Eider, have recovered at the Matrosskaya Tishina infirmary and can be transferred to the Lefortovo prison upon rehabilitation, Moscow human rights commissioner Tatyana Potyayeva told Interfax on Tuesday. "Two sailors - Andriy Artemenko and Andriy Eider - are finalizing their rehabilitation; they can be discharged and transferred to Lefortovo," Potyayeva said. The third injured person, Vasyl Soroka, has practically recovered but continues to receive therapy, she said.